I noticed this guy hanging out in one of our program rooms today as I was going through RIF books. Now, I'm not sure why he's hanging up in there, as Thanksgiving is long over and we don't really decorate in that room anyway. 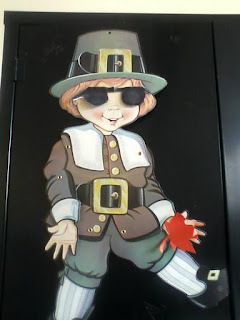 I'm also not sure why he was given construction paper sunglasses or why he has a leaf taped to his hand. I'm not sure about any of these things, but maybe we're not meant to be sure. Maybe we're just supposed to embrace it.